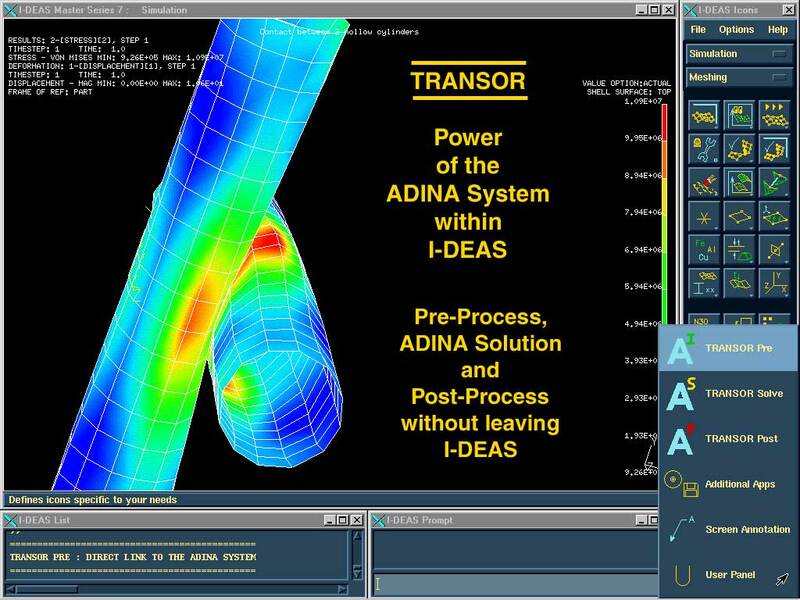 The ADINA interface program (TRANSOR) for I-DEAS NX provides a powerful environment that combines the ease of 3D solid modeling and the strength of the ADINA System for finite element analysis of structures, solids, fluid flows, and fluid flows with structural interactions (FSI). TRANSOR translates the I-DEAS finite element model for analysis using the ADINA programs. After the analysis is completed, the ADINA results are translated back into the I-DEAS database for post-processing. The interface is fully integrated within I-DEAS. It is activated with a single click on the customized icon panel. The user can stay within I-DEAS from model definition to post-processing. The easy-to-use graphical interface allows for the input of features not supported in I-DEAS. It also supports the automatic conversion of elements for certain ADINA analyses (e.g., contact analysis and u/p formulation elements). The following images show the integrated TRANSOR interface within the I-DEAS environment. TRANSOR is available on Windows only. Please click on the thumbnails for enlarged image. Contact between two tubes; Full image size (1024 x 768 pixels).